concern 'of the way the river life is handled. He enjoys eating smoked carp and other fish delicacies. Ken also has a big heart in helping others out, as he is a member of the Masonic Lodge and the Zor Shriners. His wife Jan is well suited for the title Carp Queen as she has to put up with Ken's boat collecting and being away so much fixing boats. To summarize it best, just look at his Cadillac and truck license plates that read CAPT- KEN. 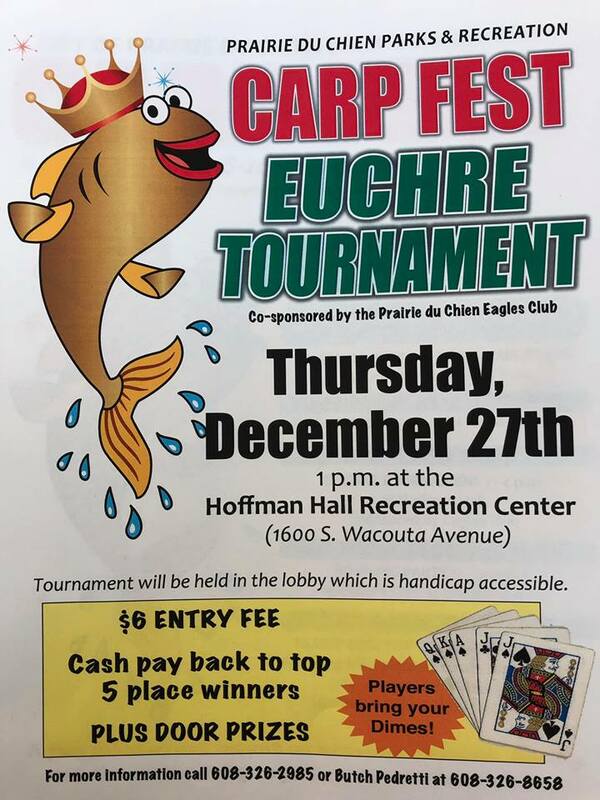 *Excerpted from Ken and Jan Meyer's nomination for Carp King and Queen. See here for additional Dropping of the Carp photos. Let the Light Show and Fireworks begin! My recollection of the 2010 Dropping of the carp will be as such. The week went by so fast I hardly had a chance to get geared up to start the work I had to finish. The weather didn't cooperate starting on Wednesday which put us behind. We persevered and the weather on the 31st threw us another curve. I think I counted the weather change 6 times that day. It started out comfortably warm, turned cold, the wind changed, turned warm, rained, the wind changed again, turned cold, and at 11:57 I could have swore the snowflakes where about three inches around. Our equipment, being tarped, survived the rain but not the wind gusts, so we had to do an almost complete reset of the light equipment at 9:00. We were able to speed up the lighting of the fireworks as we saw the crowd dissipating away from the chilliness. For a moment I felt like a rock star as I saw all the camera flashes geared toward the light and fireworks show with myself at the sound controls. We played in the New Year with some of the top pop and dance hits of 2010 and noticed a few enthusiastic hangers-on attempting to dance away the midnight chill. I only wished people could have hung around a little longer but the cold night drove them back to the comfort of the establishments with the convenience of heat. I was pumped up and the ideas for next year began to flow before the volume control was twisted back down to a non-ear piercing level. Keep an eye out for us next year. 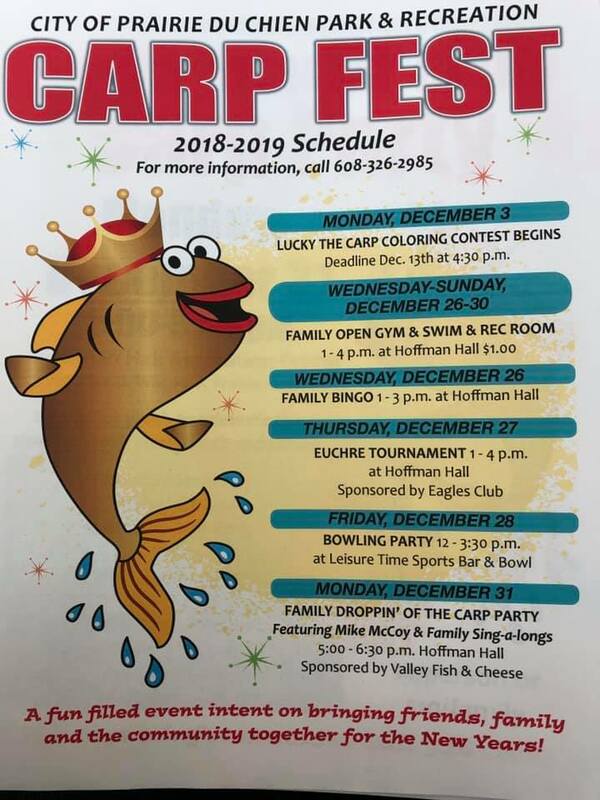 I believe the Dropping of the Carp festivities have now turned the corner of the first decade of the millennium and is now headed progressively into its teen year's. 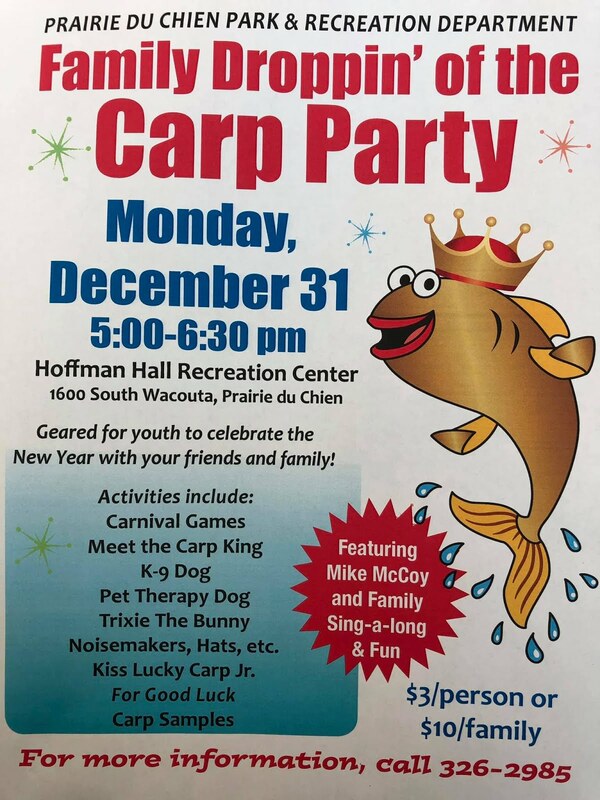 We were thrilled at the number of people that showed up and enjoyed bringing in the New Year with Lucky the Carp. The tradition of Kissin’ the Carp for good luck has been taken to a new level. What great, silly, and simple fun to enjoy the new year with high hopes and dreams for good luck for all. When I woke up early on Saturday morning I thought about the event. As I did my thoughts went right to midnight. The I stood on the stage with my State Senator Dan Kapanke, my State Representative Lee Neirison, and Mayor Dave Hemmer who read a proclamation from Governor Doyle proclaiming the Droppin of the Carp day here in Prairie du Chien. For Lee and Dan this is the 4th year that they chose to spend New Years Eve. It’s humbling, to know they wanted that those three men chose to spend that holiday in Lucky Park in downtown Prairie du Chien Wisconsin. Thanks to all that joined us that night and Happy New Year. 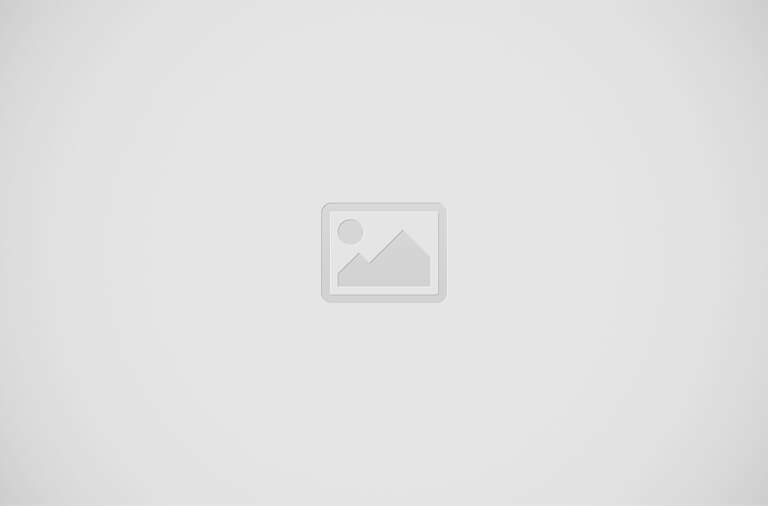 Prairie du Chien Parks and Recreation Director. The air was crisp and a slight mist began to fall but that didn't stop the 7 Carp Fest runners on Friday 31st, 2010. The top runner Dave Farmer came in at a time of 20:43, Second place, Roger Kordus 22:45, Third, Andra Boos 24:45, Fourth, Linda Kordus 26:13, Fifth, Bernie Bartels 27:24, Sixth, Paul Bartels 31:28. To finish the race Margaret Eggan came in at 32:21. At the time of registration the runners gave cans of fish products that were later donated to the food pantry. Food coupons from local businesses were given to the dedicated runners for their great efforts.The top runner did receive a Carp fest hat. The Carp Fest committee thanks the 2010 runners for their partcipation and hopes to see them back next year and a few more brave runner for the 2011 Carp Fest Walk/Run.